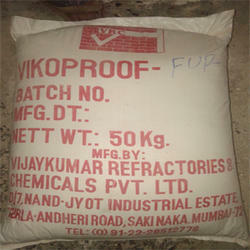 We are providing diverse range of Vikoproof Resin Cements. Vikoproof - Fur Furan Resin Cement is a pure furfuryl alcohol based resin cement resistant to both acids, alkali and most of the solvents. The shrinkage on setting and hardening is less then 1%. It does not resist attack by HNO3, Conc. H2SO4 aniline and monochloroacetic acid. It can withstand temperature upto 1500C. It can withstand alternate action of acids and alkali. A special carbon filled variety exists to resist Hydrofluoric Acid (HF) and hot Caustic. Vikoproof - EP Epoxy Resin Cement is a 3 parts system consisting of a resin, hardener and inert filler. It provides a tough adhesion to acid resistant bricks and therefore used for fixing tiles or as joint filler between tiles. It can also be used as coating and screeding material for industrial flooring in thickness from 250u to 3-5 mm. Vikoproof - EP Epoxy Resin Cement has excellent resistance to caustic soda, caustic Potash and other alkalis. It is also resistant to certain acids and solvents. It can withstand temperature upto 80oC. Vikoproof - EP Epoxy Resin Cement is highly recommended for usage in food and pharmaceutical industries.